First of all, let me debunk the myth that psychics actually connect with you directly via a phone line or electrical wires, or computer hardware for that matter! This is simply not the case. Psychics do not make a connection with you on this earthly plane or realm (or what is referred to as the reality of space and time). Instead, the connection is made in the spiritual realm. Some call it ‘The Other Side’; others call it the ‘Astral Plane’ or the ‘Fifth Dimension’ or even ‘The Divine Matrix’. Gifted psychics and clairvoyant mediums have a sixth sense or Extra Sensory Perception (ESP), which enables them to access this alternate spiritual plane or realm, where we are all connected. On this plane we read energy vibrations or receive messages from spirit guides, angels or other divine entities. The simplest way to understand this Higher Spiritual Plane that we work on, is to imagine it as a ‘spiritual web’ or a ‘cosmic internet’ to which we are all connected. Everything and everyone in the Universe is connected, because everything is made of pure energy. Now, during a long distance psychic reading, when I want to connect with you as client on the other side of the world, all I need to do is link my energy with yours, almost like connecting two ‘psychic computers’ over this ‘spiritual internet’. This is the reason why psychics will often ask for your name, or your birthdate, or even a recent picture or an object that belonged to a person who crossed over. Remote viewers use a similar technique by assigning random numbers to a target to serve as a reference. We basically need your ‘spiritual address’ – some or other simple reference point or ‘plug in’ to make that initial connection with you. It is almost like coordinates for a Global Positioning System (GPS) device in your car, or an IP address for a website. 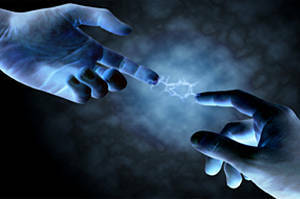 Once this basic connection is made, there is a free flow of energy or ‘spiritual data’, which the psychic then taps into and interprets for you. Psychics and mediums receive and process this information in different ways, via their sixth sense, including clairsentience (sensing), clairempathy (feeling), clairvoyance (seeing) and clairaudience (hearing) and claircognizance (knowing). In more rare cases some also use their gifts of clairgustance (tasting) and clairescence (smelling). 4 Responses to How Do Psychics Connect Long Distance? Thank you for your feedback Jill! I cannot pretend to know or grasp all the mysteries of the Universe, but what I can offer is my own truth as it is revealed to me. Amazingly one’s perspective or understanding also shifts or deepens with time, as you learn more, increase your consciousness and awareness and develop greater insight and wisdom. We are never too old or too smart to learn something from each other. It is therefore good to know that we do not learn and discover all by ourself, but that others share our journey and insights. And I love the fact that the Universe and our spiritual heritage remains a continually expanding riddle for us to explore further every day. Life would be so dull without it. 😉 Keep up the good work!